BATON ROUGE, La. -- Shawn Jordan relaxes on a padded bench inside the LSU football team's weight-training facility. Tattoos snake out of his purple tank top. He's bald, but only because he recently shaved his red Mohawk. A tongue ring sometimes smacks against his teeth as he speaks. Upon cursory glance, he looks like a thug hired to work the door at the local biker bar. Jordan's frame is particularly imposing. At 6-feet and 265 pounds, his shoulders are broad and boxy and his arms formidably massive. His thick hands appear capable of twisting human limbs into balloon animals. He's Shrek, in human form. Nonetheless, the former Tigers fullback turned UFC heavyweight will quickly remind you that it's unwise to judge books (or animated ogres) by their covers. "If you saw me from across the street, you'd probably think I'm an a--hole who is just looking to beat someone up," Jordan said. "If you really knew me, you'd see I'm not a macho guy." The self-assessment seems overly-humble. Jordan helped LSU win BCS Championship rings under Nick Saban (2003) and Les Miles ('07) and was a record-setting leviathan on the football team's all-time weightlifting charts. And these days, he's a prodigious mixed martial artist who enters Saturday's main-card bout against Cheick Kongo at UFC 149 only months removed from brutalizing Britain's Oli Thompson in his UFC debut. It's hard to believe his sincerity. But Jacob Hester knows the truth. Jordan's ex-LSU teammate and the current San Diego Chargers running back refers to his buddy as, "a tale of two different people." "When Shawn walks into a room or a bar, people are going to check him out because he looks like a bad dude and he was also an animal on the field," Hester said. "When he's just hanging out, Shawn is one of the most soft-spoken, laid-back guys in the world. He'd do anything for you." Greg Jackson also sees the softer side. The venerated MMA coach recruited Jordan because of his beastly power and athleticism, but values the calming presence he brings to the New Mexico-based Jackson-Winkeljohn MMA Academy. According to Jackson, Jordan (13-3 MMA, 1-0 UFC) is the consummate team player who enjoys keeping things light around veterans like Keith Jardine, Clay Guida and current light-heavyweight champion Jon "Bones" Jones. It's an attractive dichotomy, the kind he appreciates in a fighter. "Shawn likes to wear pink wraps around his fists before he practices just so people will give him a hard time," Jackson said. "He's always joking around and he's a big goof. Shawn's also one of the toughest guys we have here -- make no mistake. He's definitely an asset." The work ethic and affable personality were cultivated amidst the squat racks and dumbbells of his alma mater. It's a special area that fueled his intensity on the field and paved the way for an eventual career in the caged octagon. As he gazes about the purple-and-gold colored room, Jordan waxes nostalgically about the grueling hours he spent pumping iron and maturing into the grounded adult he is today. "This place has a huge presence," Jordan said. "Everything I went through in here helped me grow up. I always had a work ethic, but I took it here and this room became a coming-to-manhood place for me. When graduated players come back, I think we all see that our time here was a huge part of our life that helped us become men." Jordan had already become a man at an early age -- at least physically. The second oldest of four brothers in their El Paso, Texas, home, Jordan weighed 180 pounds by the fourth grade. His mother, Charlotte, enrolled her sons in a youth football program to keep them active. Jordan's size, coupled with his natural ability, made him an early standout. At 9, he briefly took up wrestling and was competing against older boys in both sports. By the time Jordan was a freshman at Riverside High, he was bench-pressing 315 pounds and earning all-city accolades as a varsity defensive end. However, it wasn't until Jordan switched to running back that major colleges started taking notice. Jordan finished his sophomore season with 800 yards rushing, 600 receiving and 14 touchdowns. The following year, he racked up more than 1,000 yards on the ground and 15 additional scores. Though clocked at 4.6 in the 40, Jordan was more bulldozer than sports car. "I was just running people over," he said. "There was no thought process." That was reserved for the classroom, where Jordan maintained a 4.0 grade point average. Jordan returned to the wrestling mat after football ended and captured state titles in the 215-pound weight class during his junior and senior seasons. Still, athletics took a backseat to academics. "Sports were just something I did to stay competitive," Jordan said. "I wanted to become a doctor one day. I was actually a smart kid." But back then, he realized football was his meal ticket to a college degree. By the time Jordan capped off a brilliant senior campaign with 1,200 rushing yards, 800 receiving and 18 touchdowns, he had spurned offers from Texas, Oklahoma State, Stanford, UCLA and Colorado. His heart was already committed to another suitor. "Coach Saban was the first person to offer me a scholarship, going into my junior season," Jordan said. "I chose LSU because of the facilities and their academic center was amazing." Little did he realize that some of his biggest life lessons would be learned away from the lecture halls and playing field. Mistakes provided Jordan with opportunities to learn. The occasional gaffes on the gridiron took precedence over the galvanizing tackles and blocks. They lingered in his mind. They made him reflect. They helped him grow. Jordan made the most of his first two years with the Tigers. He watched LSU defeat Oklahoma to win the BCS Championship as a redshirt freshman and the next season continued to make strides as a backup fullback and regular on special teams. He particularly thrived in LSU's strength program, setting school records in the bench press (610 pounds), power clean (440) and split jerk (440). "Shawn is one of the most powerful guys I have ever been around," said LSU strength and conditioning coach Tom Moffitt. "He was a hard-nosed, tough kid." However, Jordan's toughness wasn't truly tested until late spring after his sophomore season. On his return trip home from a visit to Juarez, Mexico, to watch horse races, U.S. Border Patrol performed a routine check on his friend's truck. That's when Jordan's world imploded. "They found a small vile of anabolic steroids," he said. "I was sick to my stomach. I thought I had lost everything. I bawled like a baby." Moffitt saw the story break on SportsCenter and called that evening to offer support. "It was a huge setback for Shawn," Moffitt said. "He was already so big and powerful, and now people were pointing fingers at him." After getting released from jail, Jordan willing submitted to a drug test and passed. Over the next year, he tested clean on many more. "I studied chemistry, so I obviously knew the negative things steroids can do and would never put that stuff in my body," Jordan said. "I still gave the team a negative image in the media. I was ashamed that I even put myself in that position and take full responsibility." The case was dismissed in court and Jordan returned to the team with a new mindset. He alternated at fullback with Quinton Johnson during the next two seasons and plowed lanes for a rushing attack that helped the Tigers advance to the Sugar Bowl and defeat Ohio State, 38-24, during his senior year. "I appreciate my time at LSU much more now," Jordan said. "It was a huge part of my life that helped me learn and grow up. Everything that happened to me, good and bad, made me mentally strong." An NFL career never materialized for Jordan, but another door quickly opened. "I'd always pick up the linemen in college and slam them on the power mats in the gym," Jordan said impishly. "They'd run from me. A lot of the players told me I should fight one day." And so he did. Within weeks of finishing his final season with the Tigers, Jordan competed in his first amateur heavyweight MMA bout. Hester, along with current Seattle Seahawks quarterback Matt Flynn and a throng of other ex-teammates lined the walkway to the cage. "It was awesome that they all came, but I broke my hand on my first punch and the fight was stopped early," Jordan said. He wasn't done. Jordan rebounded to win nine consecutive fights. His brute size, strength and grappling background made him a quick study. It didn't hurt that he's also a little crazy. "When Shawn gets hit in the face, he sticks out his tongue and laughs," Hester said. "Punches don't seem to hurt him." The same couldn't be said for his opponents. After submitting Jayme McKinney via arm-triangle choke to win his first professional fight at Bellator Fighting Championships 9, nine of Jordan's next 11 victories were earned by knockout. As Jordan continued to climb the ladder, a transition to the UFC seemed inevitable. "My mom always said you don't do anything to be second best," he said. "I wanted an opportunity to beat the best opponents in the world." Jordan became a welcome addition to Jackson-Winkeljohn MMA in June 2011. Once there, he ran the undulating sand dunes and foothills outside of Santa Fe to prepare for his first UFC bout, an undercard showdown against Thompson at UFC on FX 2. "We liked Shawn because he's a tremendous athlete and he's built like a power lifter," Jackson said. "He can hit, but he also has ground skills. He can do it all." This revealed itself in his debut. After thwarting Thompson's attempts to pin him against the cage in the first round, Jordan ended the contest midway through the second with his fists, sending the erstwhile title-holder of "Britain's Strongest Man" away from the cage with two swollen eyes. He's planning an encore performance against Kongo (17-7-2 MMA, 10-5-1 UFC), another heavy-handed brawler with knockout power. Jordan backed into the contest when former heavyweight champion Antonio Rodrigo Nogueira withdrew due to an undisclosed wrist injury. Jackson is confident in his protégé's chances. 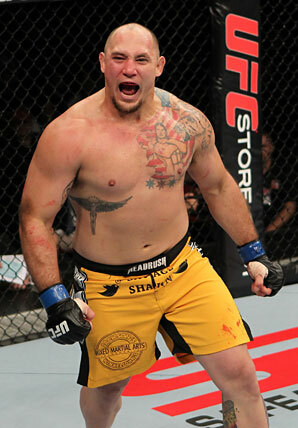 "After the [Thompson] fight, we felt really comfortable with Shawn's striking," he said. "There's no doubt he has the potential to go all the way to the top." Moments before leaving the LSU's weight-training facility, Jordan looks around one last time, reflecting on his past and his future in the same breath. The room signifies a time in his life when he overcame physical and mental adversity. It's serves as an inspirational reminder that hard work makes the impossible seem possible. It was also a place that instilled humility -- even in an athlete who looks like a menacing MMA monster. "I don't care about psyching people out," Jordan says. "If you ever watch my fights, I smile, laugh and mess around because I'm enjoying the experience. I'm not hateful to anyone." Try telling that to some of the Tigers' current linemen. "Some of our big guys saw Shawn coming down the sidewalk when we were in the weight room last season and said 'Coach, we gotta go,'" Moffitt said. "They thought he was a dangerous type of guy that they didn't want to deal with. It's the way Shawn looks -- he comes across as intimidating." Hester knows better, but plans to stay on Jordan's good side just in case. "Shawn definitely has a presence," he joked. "I'm just glad he's one of my friends and not an enemy."